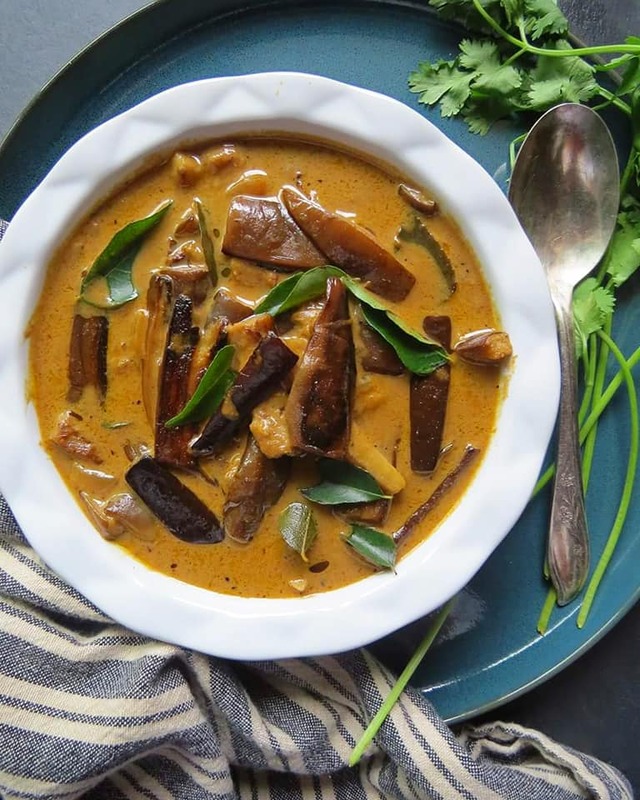 One of my most requested recipes to date has got to be for Sri-Lankan eggplant curry. I have been avoiding writing up this recipe for a long time because I had simply stopped making it at home. Traditional eggplant curry requires that the eggplants be deep-fried before tossing with the spicy curry, however I do not deep-fry anything. Some of you suggested roasting the eggplant in the oven with a little bit of oil and I did just that! I’ll have to admit that the taste is not the same, however it is still pretty good and definitely a healthier alternative. In a pot on medium-high heat, heat the oil. Add the onions and fenugreek seeds and sauté until onions turn golden. Add the garlic and curry leaves and stir until the raw smell disappears. Add the tamarind juice, water, curry powder, and salt. Turn the heat down to medium-heat and cover. Let the gravy cook for about 10 minutes until onions and garlic are soft. Lower the temperature, and slowly add the milk. Stir as you add the milk to prevent curdling. Continue stirring often until the gravy reaches a boil. Let the mixture boil and thicken. 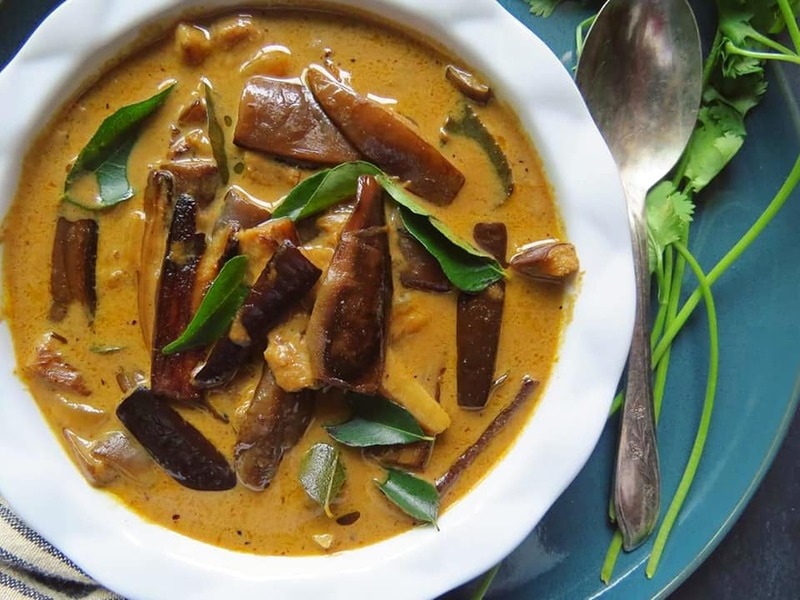 Add the roasted eggplant and let the curry simmer for 5-10 minutes or until desired consistency is reached. 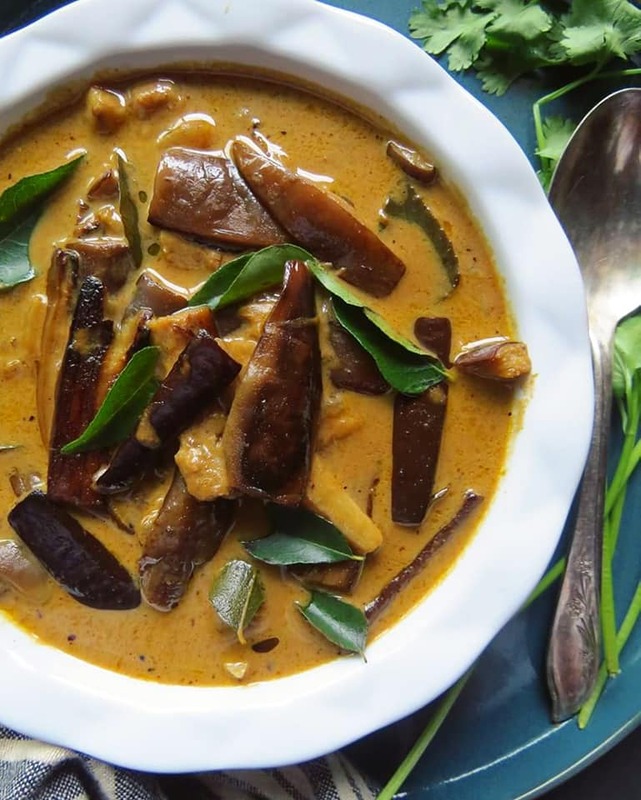 Serve warm with other curries and rice. To prepare the eggplant – Wash, dry, and trim the ends of the eggplant. Cut into long bite-size pieces. Coat with a little bit of oil and place in a single layer on a dark metal baking sheet. Roast in an oven preheated to 350 degrees for approximately 20 minutes, flipping halfway. Let cool and store or use in curry. Hi is it cows milk? Usually I add coconut milk but does it taste same with cows milk too? Hi, I used cow’s milk but you can use coconut milk too.